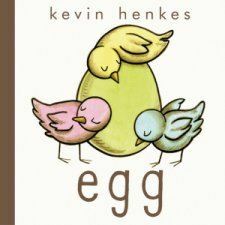 Described as “a graphic novel for pre-schoolers”, Caldecott Medallist Kevin Henkes has woven a magnificent story with the minimum of words and some seemingly simple illustrations. Using the softest pastel palette, simple lines and shading he conveys so much emotion and action that even the very youngest reader will be able to sit and tell the story to themselves and their teddies without having to know one word of the sparse text. They will enjoy predicting what might be in that final egg and be surprised when the secret is discovered. Could that really be inside an egg? Are birds the only things that hatch from eggs? They will also empathise with the surprise when it is left alone and lonely, perhaps able to express their own feelings when they have been in a similar situation. A perfect opportunity to build a word wall of synonyms for ‘sad”. Inviting them to retell the story will encourage them to organise and order their thoughts, begin to understand sequence is important, and use their own words and language skills to express what happened – critical elements in developing early reading skills. And of course, this story is the perfect lead-in to the classic tale of The Ugly Duckling. Brilliant for littlies but older children could gain a lot from looking at the techniques used to produce so much from so little. This entry was posted on June 30, 2017, in Belonging, Birds, Concepts About Print, Emotions and Feelings, Friendship, Picture Book, Preschool, Review.